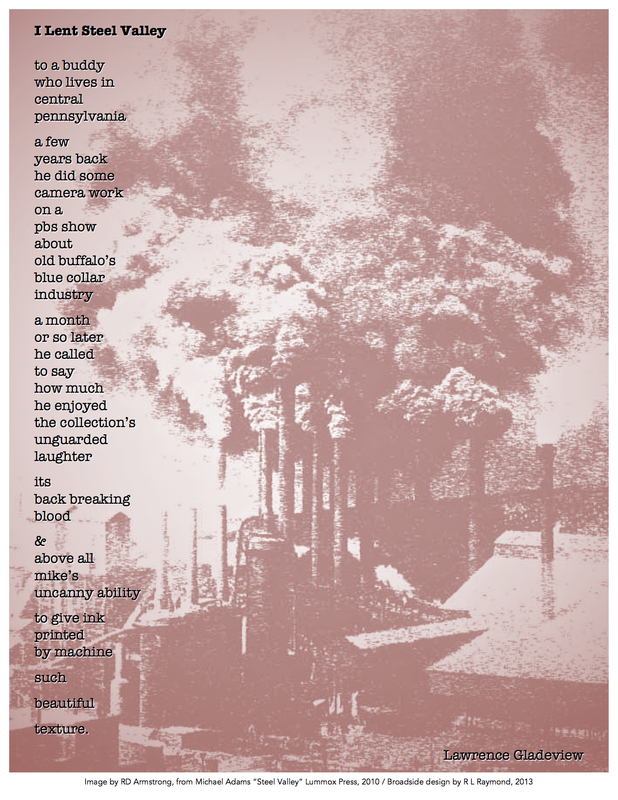 This limited edition, letter pressed broadside was printed for a tribute reading for Colorado author Michael Adams who passed away in September, 2013. The reading took place at Denver’s Glovinsky Gallery of Contemporary Art in November, 2013, & I was honored to be one of three featured readers commemorating Michael’s life. One hundred of these broadsides were printed by long-time Denver publisher Tom Parsons on a 1917 letter press machine. The poem itself was pressure fitted in an aluminum frame, letter by letter & is in reference to Michael’s phenomenal poetry collection, Steel Valley (Lummox 2010). The broadside also features original artwork from Steel Valley & was beautifully designed by author & artist RL Raymond. Each broadside is available for $2.00 including shipping, & currently only 50 remain of the one & only first run printing!